The American Motorcyclist Association quietly released an updated position on lane splitting in early November. This is exciting news for us here at LaneSplittingIsLegal HQ—I’m an AMA member, but I’ve also been frustrated that the AMA didn’t take more of an active role in the discussions on this topic here in California and more recently in Nevada, where we saw near-successful attempts to add a second state to the list of “US states that are awesome enough to allow lane splitting.” Given the huge number of motorcyclists in California, AMA members and non-members alike have wondered why the organization wasn’t more supportive of on such a pivotal issue for California riders. Translation: the AMA will help folks who are trying to legalize lane splitting. Yes! This is a big deal—this support could help drive success in Nevada in 2015, where AB 236 got so close earlier this year, and help get the ball rolling with a little more momentum in states like Oregon, where two bills didn’t get enough steam to make it out of committee this year. I sat down to discuss the new lane splitting position statement with AMA Board of Directors member Jim Viverito and AMA spokesperson Pete terHorst in late November. Jim—who’s been involved with motorcycles as a street and off-road rider since his teens and has been active in both ABATE of Illinois and the AMA for many years—was one of the main drivers behind the research and development of the position statement. He’s been on the AMA Board of Directors for four years, focusing on government relations, and is the chair of the Rights and Advocacy Committee. Jim says that when the CHP guidelines were released in early 2013, the topic of lane splitting became “very controversial” on the AMA Facebook page and he began to be approached by “members who were commuters and rode their motorcycles every day… about what they would have to do to make lane splitting legal.” He felt strongly that the committee should respond to the membership, so after some discussion, the board decided that the AMA should have a position statement in this area and the research began. Over the course of several months, the official AMA Position Statement on Lane Splitting took form. Jim says he’s “big city-oriented” and thus understands that “the ability to get through traffic is something that motorcyclists—if it was legal—would really love to do.” While previous statements from the AMA voiced concern from some members about drivers associating lane splitting with stunting and other negative behavior, the new position statement reflects a more practical understanding of the benefits of sharing lanes but at the same time acknowledge members who aren’t in favor of lane splitting, saying “Motorcyclists who oppose lane splitting should remember that it is optional in California. Permitting lane splitting is not the same as requiring it, so those opposed to the practice should consider the desires of other motorcyclists who believe they would benefit from it. Lane splitting is an issue of choice.” This is in line with one of the constants in AMA positions: choice. The research Jim and other board members did before releasing the statement was comprehensive—obviously, there was focus on California where there’s “proof in the pudding that it’s successful,” but the AMA also looked to Europe and other parts of the world where “lane splitting is standard operating procedure.” When looking at other nations, they saw that “all the single track vehicles are allowed to split the lanes and go up to the front… we felt that was something that could reduce traffic congestion, cut down on the possibility of rear-end collisions and stuff like that, that happens a lot with motorcycles at stoplights.” The committee also looked at the Belgian study (available on our lane splitting resources page) which found (using traffic models) that a significant number of riders splitting lanes instead of driving would actually reduce congestion for everyone. We talked about the two primary complaints drivers have about lane splitting: misinformed safety concerns—”that looks so dangerous!”—and jealousy—”they’re cutting in line!” Jim noted that when done sensibly (for example, according to the CHP guidelines) lane splitting “can be actually a very safe thing to do. It actually makes the daily commute for a motorcyclist safer… but we need to figure out a way to make people understand it.” He also said it will be difficult to overcome the jealousy factor, but believes that training and education will be pivotal in states where lane splitting is eventually legalized, and emphasized the need for education to accompany any lane splitting legislation. It’s worth noting here that in Nevada, where AB236 was almost passed earlier this year, there was a very dedicated group of local riders working on the bill. Check out that bill’s progress and video of proceedings here. This grassroots effort by Nevada riders is a perfect example of local riders making a difference—and going forward, the AMA will coach and enable such groups in their efforts. In keeping with the themes of freedom and choice that the AMA adheres to, the organization will not support bills that would legalize lane splitting in exchange for a helmet requirement. As an example, Jim told the story of SB2439, a bill from back in 2006 that would have legalized lane splitting in Illinois, but required helmet use. Because of the helmet requirement, riders were split into multiple factions and the bill was unsuccessful. As an example, he pointed out the genesis of the lane splitting position statement: “The idea of lane splitting throughout the rest of the country really exploded on the AMA Facebook page, and a lot of the people posting about it were people from my area. So I started to question them about it face to face, and so the position statement became actually priority for me. We responded to the membership—this is a prime example of the squeaky wheel got the grease.” He also pointed out that there are lots of other squeaky wheels the AMA believes are very important and spends a lot of time and resources on, such as public lands and E15. California riders who have not joined the AMA because they weren’t supportive of lane splitting have no reason to abstain any longer. The AMA not only endorses lane splitting, but will assist riders seeking to legalize lane splitting in their states. Even though California riders have a bit of reprieve on SB 350 (for now) it’s of the utmost importance that we continue to be good ambassadors—splitting responsibly and safely, in line with the CHP guidelines—and continue to educate both riders and drivers, if we want to keep lane splitting legal. 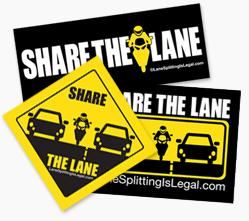 The AMA lane splitting position statement reflects this viewpoint, and reinforces our recommendation here at LaneSplittingIsLegal.com that riders should join the AMA to help us have a voice on these matters. One of the things I use to counter the jealousy aspect is to tell the people to get a bike and come ride with us… then they can do it too. That’s when they switch their tune to the, “no no no, too dangerous.” So I say fine, enjoy your stereo, A/C (or heater) and don’t worry about us. That’s a good tactic, Rob. I have talked to some folks who are interesting in bikes because they like the idea of becoming more immune to traffic.